Jedna z mála deathmetalových kapel, které jsou schopny udržovat rovnováhu mezi turné, hlavními metalovými festivaly i svými skalními undergroundovými fans. Belgičtí ABORTED se vždy velmi snažili uchovat tuto rovnováhu a zůstat věrni svým kořenům. Po albu " Strychnine.213" z roku 2008, kterým si možná znepřátelili některé příznivce svých ranějších goreově laděných počinů jako "Goremaddedon" z roku 2003, přichází v roce 2012 "Global Flatline", které tvořili čtyři roky (a vedlo k úplně nové sestavě až na zpěváka Svena de Caluwé), ale čekání se více než vyplatilo. Kombinace rychlých a pomalejších pasáží s hardcoreovou příchutí, vynikající produkce a válcující riffy. To, co uvidíte na OBSCENE EXTREME 2013, je nejaktuálnější etapa na skvělé cestě této kapely…a bude se Vám moc líbit. 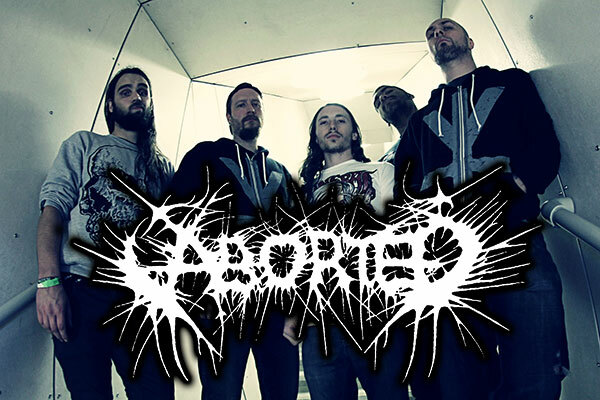 ABORTED spent the bigger part of 2010 and 2011 diligently writing the successor to “Coronary Reconstruction” and their new blood-soaked platter, entitled “Global Flatline”, has definitely been worth the wait. Two years in the making, the album reeks of dedication and intense, hard work and was produced, mixed and mastered by Jacob Hansen at Hansen studios in Denmark. Combining the band’s undeniable ferocity and brutality with a perfect balance between technical elements and a gut-ripping old school feel, it literally is the soundtrack to the end of man. “Global Flatline” offers the fastest passages ABORTED has ever created as well as the slowest ones these lunatics have ever (de)composed. “Global Flatline” is an organic wall of death metal that leaves the listener disturbed, deranged and hungry for more. The album’s morbidartwork has been handled by the gruesome Justin Osbourn from Slasher Design and contains some of the most horrid, putrid and disgusting art the band has displayed to date. It perfectly visualizes the album’s title and lyrical concept while retaining a certain retro/b-movie horror touch. As a further treat for all you death metal gourmets out there, “Global Flatline” also features several guest vocalists: Trevor Strnad from The Black Dahlia Murder, Julien Truchan of Benighted, Jason Netherton of Misery Index and Keiijo Niinima from Rotten Sound tortured their lungs and vocal chords to add even more rage to this devastating opus. So, sharpen your scalpels and grind your saws, people: This is it, ABORTED is back 666% and will not stop until all of you are dead! Judge for yourself and check the band out as they will be crushing stages this November/December on their “Engineering The Dead” anniversary tour with Decapitated. Originally founded in 1995 by vocalist Sven(cho) De Caluwe, ABORTED went through various incarnations, releasing six full length albums and several EP’s, split releases and a DVD. Now, “Global Flatline” marks a new peak in over 15 years of dedication to the extreme, and it is far from being over – support your local cannibal commando and see you in the pit!